When you think of someone with a disability, you may think of someone who has trouble with their mobility or speech, however a disabled person is defined as someone who has a mental or physical impairment that has a long-term effect on their ability to do daily tasks. There are around 13.3 million people (almost one in five) in the UK with a limiting long-term illness, impairment or disability and the most common reported impairments affect mobility, lifting or carrying. This would explain why disability rises with age as only 17% of people are born with their disabilities. Also, around 6% of children are disabled compared to 16% of working adults and 45% of adults over a state pension age. The amount of disabled people in employment has grown since 2013 as 3.5 million disabled people are now in employment compared to 2.9 million. Also, the UK employment rate among the working age of disabled people was 46.5% compared to the 84% of non-working people. Even though the amount of disabled people has been steadily growing, disabled adults (30%) are almost three times more likely to have no formal qualifications compared to non-disabled (11%) people. Employers by law must have an equal opportunities policy which ensures that when it comes to promotion and recruitment, process is fair and there is no discrimination. Employing people with a disability can benefit a company as it increases diversity and inclusion and reflects a wider community. People with disabilities may bring experience and specialist knowledge that can lead the company to new opportunities and valuable skills. Tech companies currently hire around 318,480 people in digital jobs, but figures also state that there are 48 thousand technology vacancies in London alone that need to be filled. With this being said, a number of groups are still underrepresented in the tech sector such as women, ethnic minority, people with disabilities and the LGBT community. Despite having initiatives to help increase diversity, the technology industry still seems to be struggling. Having a disability in tech can affect a person’s ability to interact with a variety of systems or devices. When using a computer, anyone can have injuries caused by constantly using a keyboard and a mouse. But simple solutions like a gel wrist pads and switching to trackpads can help immensely. Providing no touch keyboards for people with arthritis and having additional assistance for those with tremors or lack of muscle control can support people with a disability in tech. 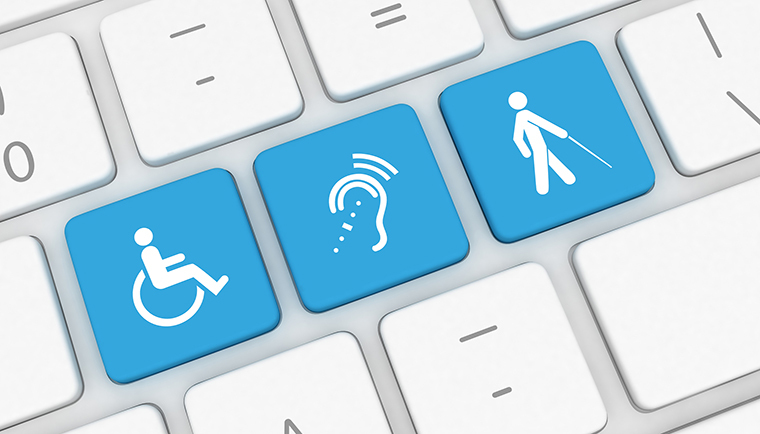 Specialist devices such as foot operated mouses or eye typers which involve the use of a camera to track eye movement can be supplied by employers and used for people who have a disability in tech. For people who are visually impaired, Windows and macOS have a range of visual themes and a built-in magnifier to help enlarge the screen. They also have built in narration that reads the text and describes the graphic elements of the screen to help people with limited or no vision. For those who cannot hear the narrator, they may be able to use braille keyboards, even though these can be expensive, the newest versions are powered by rechargeable batteries and can be linked to a range of devices by a USB or Bluetooth which makes them very flexible and suitable for people with a disability in tech. Employing people with disabilities can help your company become more diverse and successful as they approach problems with a more creative view, and this could be a huge asset to your organisation. Having a diverse group of problem solvers can enable your team to be more innovative and understand your customers in a variety of ways. The best place to start with increasing your diversity and the number of disabled people you employ is by partnering with a local advocacy groups that offer internships. Working with recruiters to help find and hire people with a disability for either internships or full-time jobs can help increase diversity and gain a variety of expertise.